I bought an iPad lately (10.5" 2017), and I want to connect it via HDMI to my HDTV. Now I know that because of the iPad screen size, I cannot get fullscreen on my TV (I have black borders right and left right now). But, is there any way I can make it work? I use this iPad for travelling and would love to plug it into a hotel TV and watch Netflix on it. But I would like to display the content fullscreen without the black borders! There are apps that detect if your iPad is mirrored to an external device via HDMI and adjust to fit accordingly. 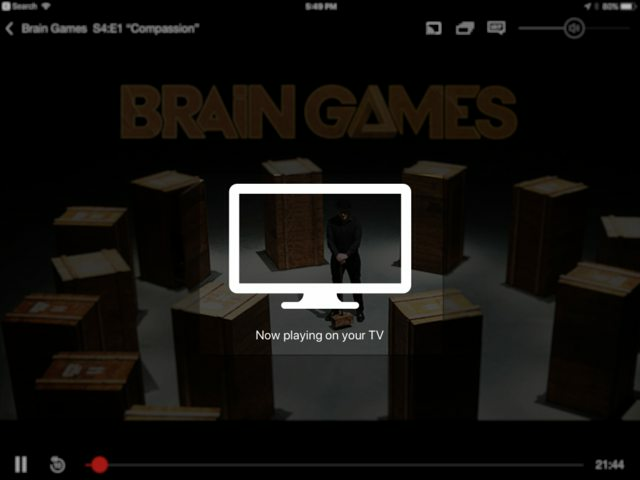 For example, the official Netflix app outputs the original aspect ratio to the external screen. The device displays the message "Now playing on your TV" as noted in the attached screen shot. The TV displays the show at the proper aspect ratio depending on its settings. Keynote and other apps work similarly. It would depend largely on the aspect ratio of the TV show or Movie being played. After some discussion with the Netflix chat support I got this confirmed. It has now been reported to the development team and hopefully they will improve the iOS app in the future so that downloads too will use the "now playing on TV" feature for full frame width on a TV with iPAD (4:3) as the source. As someone has stated, it's really a developer issue. The best solution I've found is using the zoom function on the television, if it has one. My girlfriend's television has a zoom setting called Cinema or Cinematic, which aaaaalmost gets the image to a 16:9 aspect ratio once again with non-streaming content. You can adjust the screen size on your tv. It worked for me. Not the answer you're looking for? Browse other questions tagged ipad hdmi fullscreen television . How to upgrade an iPad without losing data? Does the iPad 3rd generation output 1080p video using the HDMI adaptor?